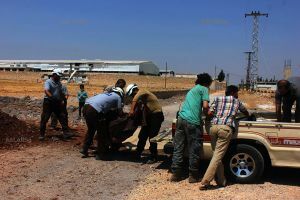 On August 12, 2016 missiles fired by a government warplanes allegedly killed 12 civilians including 5 children on a road in Hayan (حيان) town in Aleppo governorate. Video of the recovery of the bodies and the alleged rescue of a child by the White Helmets was widely distributed on social media. SNHR: at least 12 victims including 5 children died in government warplanes missiles fired on Hayan town in Aleppo governorate, August 12، 2016. There are about 20 actors altogether playing different roles typically seen in White Helmets hoax videos. The first video shows the White Helmets crew arriving at scene in a panic. A man carrying a baby runs aimlessly around in front of the camera. The second video shows a different white helmet crew at the site. The same cast is also seen in this photoset. All the bodies seen are in an state of decay and must have been dead for probably a day or more when filmed, perhaps 2-3 days. Hayan on Wikimpaia, 9 km northwest of Aleppo. 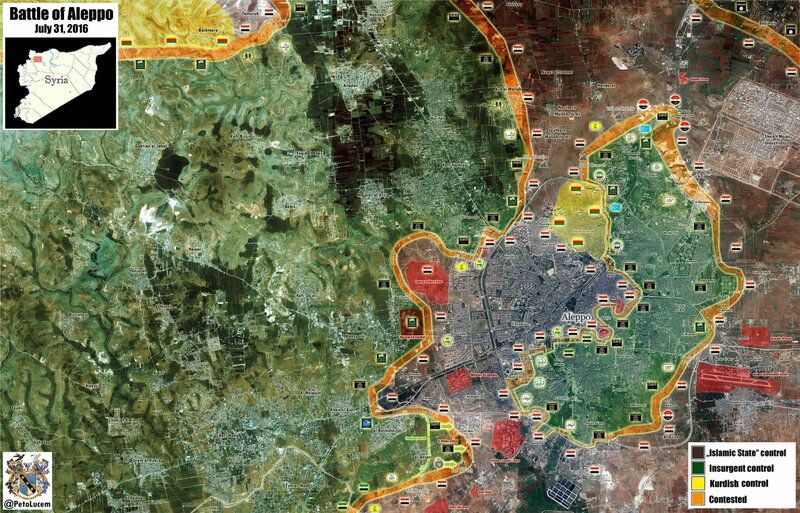 Administration: According to the August 1 Aleppo situation map, the Hayyan are is Islamist run, most influential in the area seems to be the terrorists formerly known as Jabhat Al-Nusra. Nearby and notable: Zahra and Nubol, besieged Shia villages about 5 km north, Başemra, Ezidi (Yazidi?) Kurdish village, 5 km west. VDClist 19 civilians from Aleppo killed by "warplane shelling" August 12. 12 are from "Hayyan," 7 from other places, apparently killed in 2 other strikes. Two are blamed on Syrian forces bombing, the rest are blamed on Russian forces. For Hayan, there are 3 unidentified boys, and 2 boys, 3 girls, 4 women, and no men at all of a Qraitem family. It seems the group was (allegedly) walking here with no men. Arabic family name is قريطم - a search for that shows the most recent deaths before these were about 2 weeks earlier, 3 Qraitem men, all from the same town of Hayyan, died with no women or children killed. Ahmad Ali Qraitem, July 30 - Emad Mhmud Quraitem July 29 - Adel Mahmoud Rashoud Qraitem July 29. No others for a while before or after, until the 12th. Four women might be 3 wives and a sister, second wife, adult daughter, etc. These might well be two portions of the same divided family. The men were singled out, here in turf managed by Al Qaeda (informally now), to be killed by government bombs. Then later, for some reason, the bombs ditched the chivalry or adherence to the fatwas, and went ahead and bombed their women and children as well, two weeks later. This page was last edited on 15 August 2016, at 03:28.